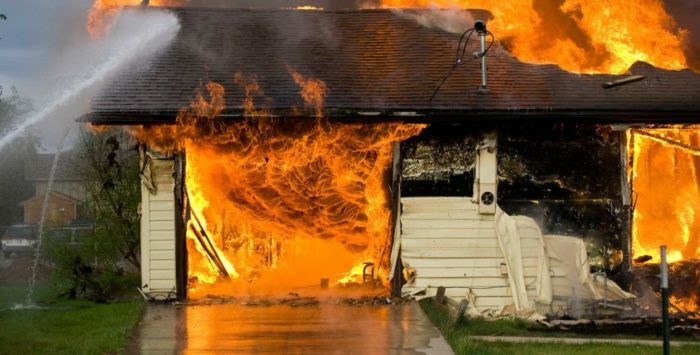 When a fire strikes your home, it is very easy to become overwhelmed with heavy losses, serious injury, and even death and lose sight of the right actions to take. You’ll need to repair your property, deal with insurance companies, handle the fire clean-up process, and more. Luckily, you don’t have to deal with all those problems yourself. Miami-Dade Restoration is able to deal with issues at commercial and residential properties swiftly. We’ve created a useful guide to help you with the clean-up and repair process when fire and smoke damage strikes. Regardless of the extent of the fire, the absolute top priority is to make sure that you and everyone in your home is safe. Fires can cause injuries of all kinds and it is important to check on the safety of your family and make sure anyone who is injured receives medical attention before dealing with your home or property. Don’t try to put the fire out yourself, often times, this may make things worse. The longer you wait to call the fire department, the longer your fire burns your property. After your emergency has been handled, you need help to inspect the damage, move your fire damaged property, removing ashes from your space, and repairing and restoring damages to your building. At this point contact the Miami-Dade Restoration. We offer 24/7 emergency services to get your fire damage restoration process started as soon as possible. Be sure to have your property inspected by repair and restoration professionals before using your electrical appliances to avoid more fires. The corrosive byproducts that are left behind after the fire can cause the damage to continue to spread. Miami- Dade Restoration has professionals with proper training and equipment to safely and effectively mitigate and restore the damage. They can remove damage and odor from soot and smoke and help repair or rebuild the structural elements and personal belongings in your home. Get permission from the firefighters before entering your home to make sure that it is safe. If your home is deemed unsafe following a fire, avoid your property and call your insurance provider to inspect the damage. In most cases you won’t be able to handle the entire fire and smoke damage clean-up process yourself, but you can certainly get things started before your repair technicians arrive. On your initial call with your insurance provider, inform them of the fire and ask them what steps you can take to help the fire damage cleanup process. This may include making a list of your items that have been damaged along with their values and keeping all relevant receipts as proof of your loss. An adjuster will explain your benefits and options to you according to your policy and help you through the claims process. Fires always leave massive damages to buildings and properties. Even a small fire could leave the need for big repairs and renovations to your property. If you are given permission to enter your home again after a fire, carefully document every item that is damaged and may need to be replaced. A public adjuster can be hired to help you document large losses. Beyond the basic clean-up process you’ll want to budget for repairs. Miami-Dade Restoration provides an all-inclusive affordable and effectively restoration services. All the clean-up process will be effectively handled and the specialized contractors will be consulted to ensure your renovations are completed quickly and effectively. Once you get the insurance claim and fire damage restoration process started, get in touch with family and closest friends and tell them about your situation as you look for a temporary place to stay if need be. After eliminating all fire related dangers from your office or home, you must take the necessary steps that will secure and protect your property. It is good to make sure that you don’t expose your personal belongings to further damage. A reputable fire damage restoration company will assess your property and advice you on what you need to do to avoid the re-occurrence of the problem.